Do you like super wonky beats, heavy bass, and weird sounds that just grime down to your soul in a delightful groove? Well, this is going to be one of those ‘Black Box’ shows that you CAN NOT miss out on! 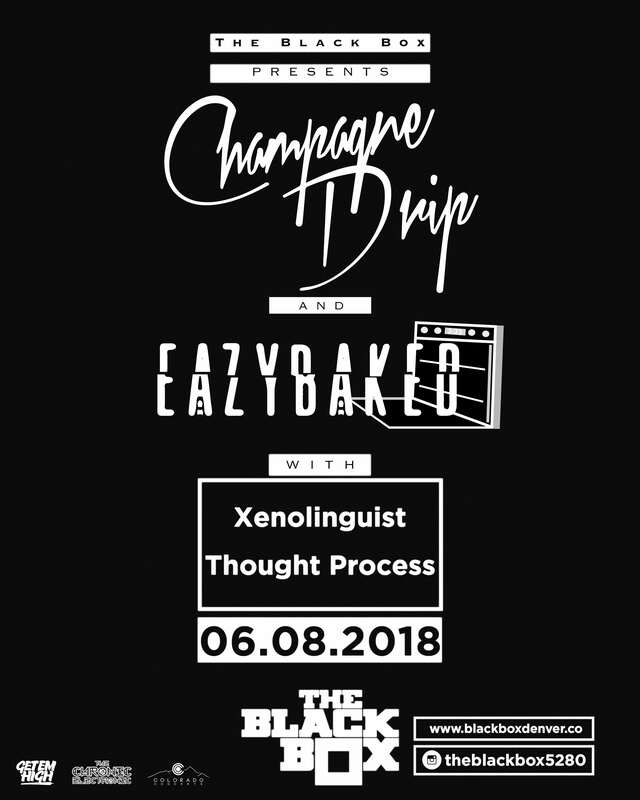 From start to finish, the artists; Thought Process, Xenolinguist, Eazybaked, and Champagne Drip will be coming to lay down those fat beats at the Black Box on June 8th. We are proud to announce we are one of the official sponsors along with Get Em High, and Colorado Concerts! The local artists supporting this one are not ones to miss! Kicking the night off will be Thought Process, an upcoming Denver producer hittin’ the scene hard. He has a chill kind of tempo filled with wonky hybrid type of sounds that match perfectly for a psychedelic trip-hop sound. (He just released a song ‘Wobbly Table’ on our first LP release, ‘Homegrown‘ which can be heard below.) Xenolinguist is another Colorado local, but with her, she takes her style of psychedelic bass music and incorporates some exotic funky-dark like beats, totally exquisite. Eazybaked, coming from Orlando, FL. will be offering some of Wakaan‘s (Liquid Stranger‘s Record Label) dankest & freshest beats. These sounds basically rip you from this planet into the intergalactic realm of gnarly sounds. A guaranteed heavy hitter for the aliens attending the Black Box. Finishing the night will be Champagne Drip who also represents Wakaan, but with several releases on Deadbeats (Zeds Dead‘s Record Label) as well. Champagne Drip balances the wonky beats and the grimy beats that attract the sounds of both fanbases. Overall, this is going to be one deep night of some of the grimiest, and ear-bending sounds in the scene. Get your tickets asap! Check out our mini playlist below and make sure to follow everyone involved! This entry was posted in Music Reviews, News, Previews & more, Upcoming Artists. Bookmark the permalink.